Since going on a vegetarian (and then scaling back to a pescetarian) diet, I have had to up my egg intake. Of course, since then I have had to bring red meat back in but I’m still eating a lot of eggs. Among other nutrients, eggs are low in sugars and high in protein, iron, phosphorous, riboflavin and vitamins B6 and B12, among other things – they also contain cholesterol and both saturated and unsaturated fats, so depending on which side of this fence you sit on, this is either a good or a bad thing. 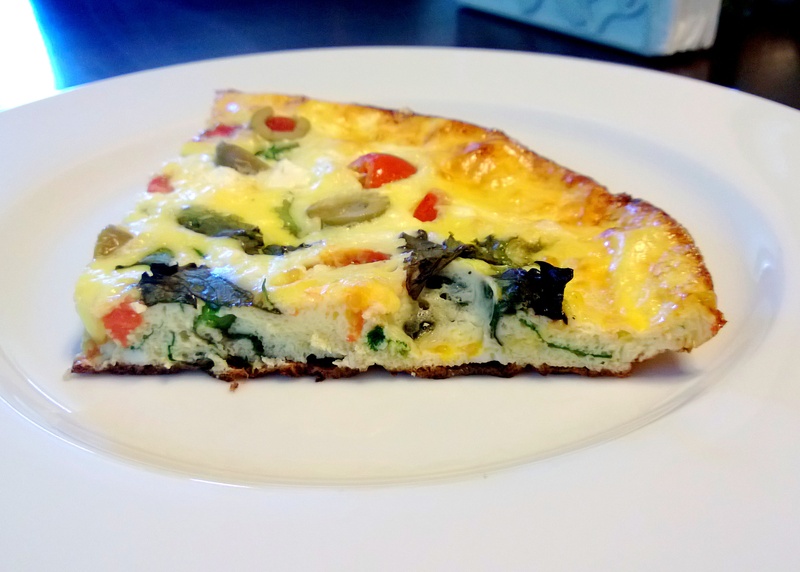 Considering I love eggs, I don’t have a problem with increasing the amount I’m eating – although I wish free range eggs were as easy to come by in Seattle as they are in Melbourne. I don’t think that “cage free” is quite the same thing, although I could be wrong. Lettuce, spinach, tomatoes and olives are low in FODMAPs. Feta cheese is low in lactose. Whisk the eggs, then add the liquid and salt and mix together until completely combined. Mix in all the other ingredients and stir well. 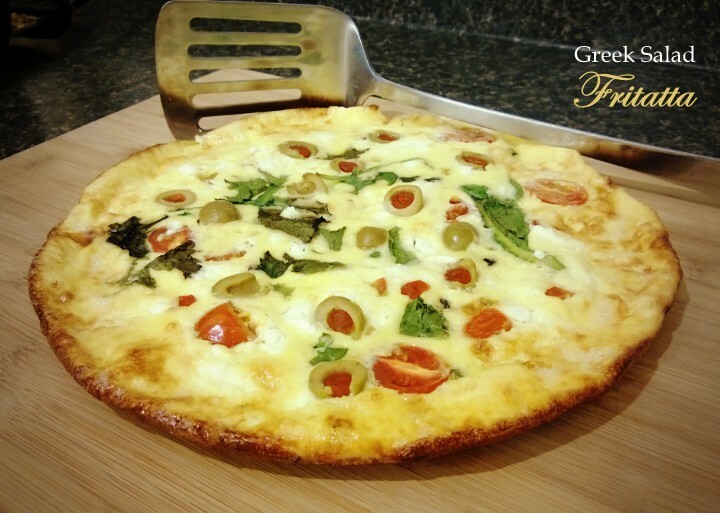 Preheat the oven to 180 C/350 F. Seal your oven-safe pan and reduce the heat to medium before adding the mixture. Let it sit, without stirring, for approx. 5 minutes, which gives the base time to cook. Now, place the pan in the oven and cook for approx. 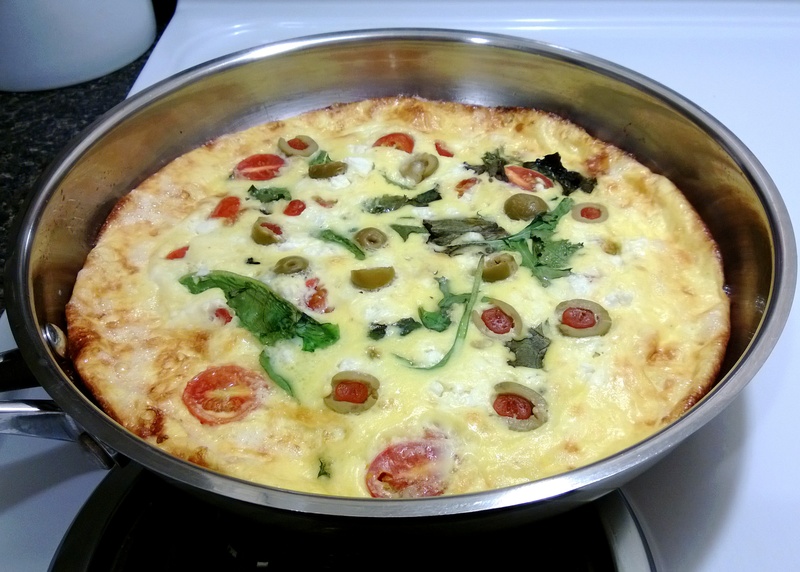 10-15 minutes; check it occasionally – the fritatta is cooked when the top is no longer runny. To give the top a little extra browning, switch your oven to the grill/broil setting and grill it for a minute or so, until it puffs up. Slide it out onto a chopping board and slice into 4 quarters. Serve immediately or leave some for left overs as it tastes just as good cold. Om nom nom. Guess who wanted some? 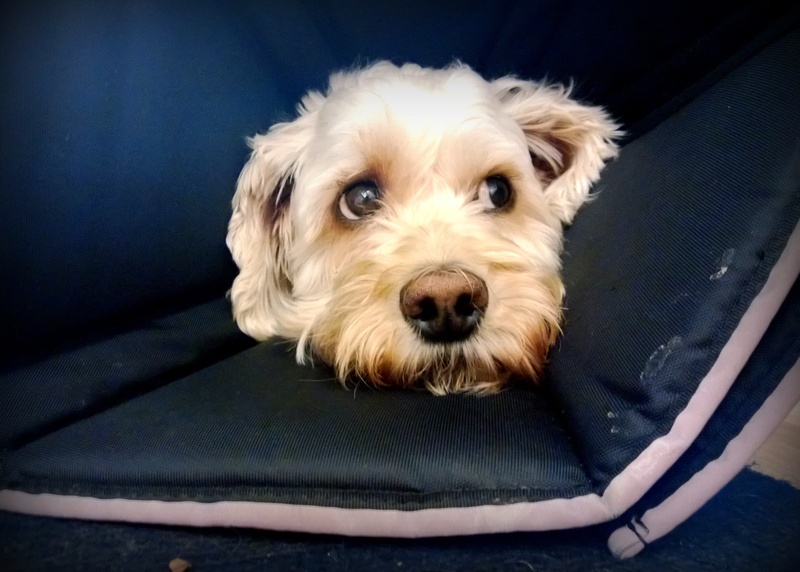 Don’t worry, he’s not still in the cone of shame – this particular fritatta was breakfast one Sunday over a month ago. This entry was posted in Breakfast, Dinner / Mains, Lunch, Vegetarian or Vegan Mains and tagged Australia, cholesterol, cockapoo, dinner, Dog, egg, eggs, entree, FODMAPS, food, fritatta, fructose friendly, fructose malabsorption, gluten free, healthy, home-cooked, homemade, lacto-vegetarian, low fructose, low sugar, omelette, ovo-vegetarian, quiche, saturated fats, Seattle, spoodle, unsaturated fats, vegetarian. Bookmark the permalink.